A range of premix ready to serve cocktails delivering a cocktail experience at home. 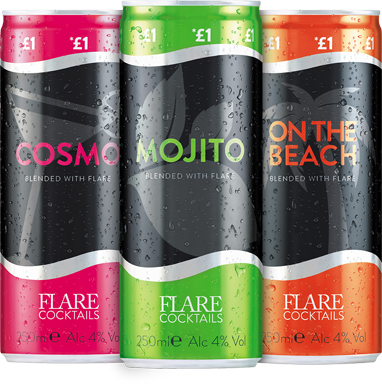 Flare Cocktails are exclusively available within independent retailers. CITY LIFE IN A COCKTAIL; OUR COSMOPOLITAN HAS BEEN DEVELOPED BY EXPERT MIXOLOGISTS TO RECREATE THE TASTE OF THE FAMOUS LIGHT AND FRUITY MARTINI: AN ALCOHOLIC MIX OF VODKA, CRANBERRY, LIME JUICE WITH ORANGE FLAVOURS. OUR MOJITO HAS BEEN DEVELOPED BY EXPERT MIXOLOGISTS TO CAPTURE THE TASTE OF A TIMELESS CLASSIC: AN ALCOHOLIC MIX OF WHITE RUM, LIME JUICE AND GARDEN MINT EXTRACT. THIS FRUIT-FILLED REFRESHING ON THE BEACH MIX HAS BEEN DEVELOPED BY EXPERT MIXOLOGISTS, TO CONJURE UP MEMORIES OF DISTANT SHORES: AN ALCOHOLIC MIX OF PEACH SCHNAPPS, ORANGE AND CRANBERRY FLAVOURS.